244 pages | 32 B/W Illus. We live in ‘knowledge societies’ and work in ‘knowledge economies’, but accounts of social change treat knowledge as homogeneous and neutral. 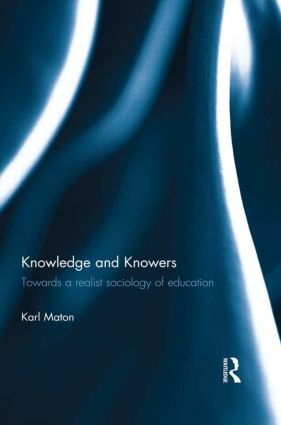 While knowledge should be central to educational research, it focuses on processes of knowing and condemns studies of knowledge as essentialist. This book unfolds a sophisticated theoretical framework for analysing knowledge practices: Legitimation Code Theory or ‘LCT’. By extending and integrating the influential approaches of Pierre Bourdieu and Basil Bernstein, LCT offers a practical means for overcoming knowledge-blindness without succumbing to essentialism or relativism. -how current debates in economics and physics are creating major schisms in those fields. LCT is a rapidly growing approach to the study of education, knowledge and practice, and this landmark book is the first to systematically set out key aspects of this theory. It offers an explanatory framework for empirical research, applicable to a wide range of practices and social fields, and will be essential reading for all serious students and scholars of education and sociology. Karl Maton is Associate Professor in Sociology at the University of Sydney, Australia, and Honorary Professor at Rhodes University, South Africa.